This abandoned town was a settlement that began in 1780. It is said that the sounds of the old town can still be heard: voices, livestock, wagons, children playing, people singing… Apparitions also have been seen of a bearded man and a child. This land is on private property now, so it is not advised to visit without permission. Bara Hack is not a village settlement, but rather a single homestead of the Higginbotham family, self-sufficient farmers and makers of spinning wheels and other turned furniture. 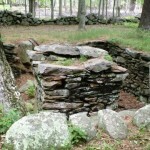 There are two house foundations on the site as the family built a newer home after their first one. The Randalls were their nearest neighbors who lived on what is now Route 97. Both families shared a cemetery about halfway between their respective houses, where they also buried their deceased servants under unmarked stones. As of a year ago the owners were not allowing access to the property. They have a caretaker on premises who will have you arrested if you are caught trespassing. You can check with Pomfret Town Hall to get the owners’ name and address. The last time I visited the area was in 2003. Took my girlfriend (now wife). It was SO quiet out there. It was the middle of the afternoon in October and what I remember were all the deer we saw that day. Besides the deer we did not see or hear anything unusual. About 20 years ago I learned about this site in a book. I drove to it, from SE MA, one day with a friend and after looking all day for it, we quit and stopped at a small convenience store at “four corners”. I asked the adult clerk if she knew where the site was and she replied no. Her daughter, also working there got me on the side and gave me directions to the site, which was a short distance from the store. She said her mother did not want the info given out because of the many incidents over the years of teens playing jokes on visitors to the site, which abuts their property. By now it was dark and not wanting to go home empty handed, we found it and walked up the path to the site. It was very quiet and looking around at the two cellar holes, I saw a faint blue-green glowing spot about 15 feet up a tree trunk. Shinning a light on it, it disappeared but came back when the light was switched off (on the next trip I verified the glowing spot was a lichen on the trunk) After an hour there with nothing else happening, we left for home. I made several more trips to the site in the next year, taking lots of photos with nothing appearing on them. On one visit my nephew tried using a swinging pendulum while we were trying to find the cemetery with no luck. I now find out it was a 1/4 mile up the “main” road going between the two hole foundations. On my last trip on a sunny calm day in the fall with a friend(whom I didn’t tell about the site being haunted), I was walking around the site about 100 yards from the foundations and was following a small group of wood ducks on the ground quaking, keeping about 100 feet ahead of me as I walked without ever seeing them. As I came to a side trail that went to the foundations 100 yards away, my friend, sitting at the intersection, said “Hey, did you find those ducks?” I was amazed since I never said what I was doing. He heard them ahead of me and said they never crossed the side road I came on to. On my last visit, I took home a fireplace brick made long ago and when I got home, I washed it and left it on my foot wide railing on my back porch to dry. The next morning I found it shattered on the driveway below and 3 feet from the porch. No wind or anyone on the porch all night. Since the brick weighed several pounds, I assumed some psychic force moved it and thus destroying it. Did the “spirits” follow the brick home??? I never went back to the site since I proved to myself and friend that the site was indeed still haunted even though it was “cleansed” many years ago before my visit. by a university group investigating the site. From what I hear now, the site is no longer accessible to the public It was a nice and interesting experience while it lasted those many years ago. Truly a still haunted site that can no longer be visited without land owners’ permission, which is very doubtful these days. I’l answer any questions about the site or my visits to it if desired.